ZIZI KODWA, the ANC's acting national spokesperson, said the ruling party fully supports the work of the Zondo commission of inquiry into state capture and would not defend anyone implicated in wrongdoing in the evidence presented at the hearings. Spilling hot beans. Former Bosasa COO Angelo Agrizzi has implicated ruling party’s top figures during his testimony at the State Capture hearings this week. On Friday morning, former Bosasa COO Angelo Agrizzi testified that he attended a meeting at a stadium in Rustenburg at the behest of Bosasa youth development director Syvion Dlamini in 2016. The meeting, at which Dlamini and the then-MEC for Social Development in North West were present, was called to discuss a request for electioneering funds. Agrizzi told the commission that he could not recall the MEC’s name but remembered that it was a female. He also put the amount of the transaction at R3.4 million and said the amount paid to the individual (presumably the MEC), was R1.8 million. Agrizzi also confirmed that the MEC and Dlamini had ties to the same political party. When asked which party the funds the two were affiliated with, Agrizzi was reluctant to answer. “Do I really have to answer that question, Chair?” Agrizzi asked. After initially chuckling at the whistleblower’s obvious discomfort, commission chairperson Deputy Chief Justice Raymond Zondo pressed him and Agrizzi reluctantly replied that “it was the ruling party”. Agrizzi then detailed how Bosasa would launder the money to make payments using youth centres and bogus software sales. 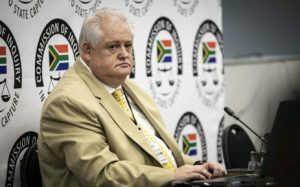 Over the past three days, South Africans have listened with a sense of incredulity as Agrizzi chronicled the extent of the corruption and influence peddling Bosasa engages in to obtain lucrative government tenders. While the Gupta family has long been seen as the main players in the state capture arena, Agrizzi’s testimony has revealed that Bosasa, in fact, benefitted more from its dodgy deals with state institutions than former president Jacob Zuma’s Indian-born friends.